I should have known this guy had gone too deep too soon. He was aero-tucking at 20mph on the flat and riding on his top tube like he’s Chris Froome. His ambition must have got the better of him. He seems to be looking for any aero gain he can to make it round easily, but we’re only 20ish miles in and haven’t hit a serious climb yet. I see signs for the A66 and turn to see Morgan just behind me, a guy I’ve been riding with on and off for most of the way so far. “Yes! We’ve got a group!” I say as Captain Aero, myself and Morgan set off down the A66. I take the front and do my turn. Captain Aero takes over and goes all out to impress somebody. I’m not even pedalling and I’m cruising at 40mph on Captain Aero’s wheel, awesome stuff! He pulls to the side of the road and disappears never to be seen again. I presume he’s still trying to aero-tuck his way up Honister pass? At 113 miles (182km) long it’s not the longest sportive, and with 3900m of vertical ascent it’s not the most ascent either. So what gives this sportive its fearsome reputation? Well that would be its steepness, or more accurately the inclusion of a climb pitching up to 30% at just over 90 miles (145km) in. So is it all just marketing and over hyped to make it sound bad? Because the top riders finish in under 6 hours so it must be pretty quick in places right? I took on the challenge to find out. Descents are fast, just look at that road. The roads were wet at the cold morning start, so tucking in behind riders to save effort meant a face full of spray, but it would be worth the small discomfort to save any effort now. I knew my legs would be burning later, and I was not wrong. Not just familiar tired aching, but a deep burning pain that seemed to take too long to subside after the effort stopped. I’d pushed pretty hard in the morning, and I was paying for in toward the end, but I was nearly home I just had to keep turning the pedals upwards towards yet another summit. Riders all around me were grabbing their legs and talking of cramping as they grimaced their way up in the 24°C heat. 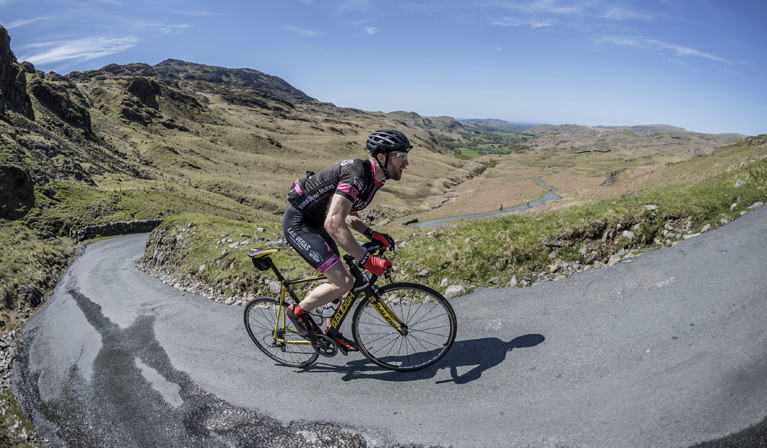 The fact is everyone talks about Hardknott and Wyrnose pass right at the end of this sportive; I don’t want to sound like I’m stating the obvious but yeah they are hard, and however hard and fast you push before it will affect how much pain you receive on these. The dread of what is coming does hang over you all morning and affect your ride. You’d have to be pretty confident to just smash all the way around this route without holding something back for the three (they added a 25% climb immediately after Wyrnose in 2017) steep climbs at the end. 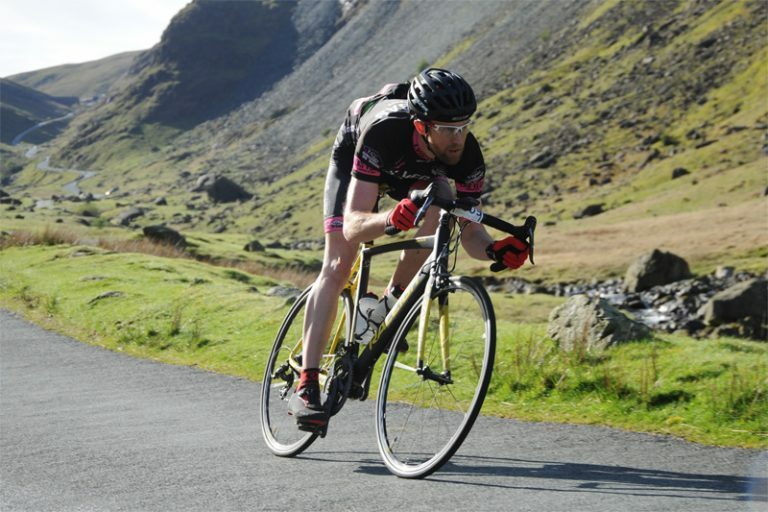 The first thing you should know is that the Fred Whitton is competitive, the top times are set by serious athletes. It’s not a race remember, but some serious pride is as stake to those who’ve got that competitive gene. I like to think that if you set a good time on the Fred you’ll be bragging about it to your grandchildren as you challenge them to beat it at your 80th birthday party. Riders come year after year to try and beat their times, infact a Strava friend of mine who also rode it this year asked for some training and diet advice as he’d like to come back and set a better time in 2 years. Yes that’s correct, he’s planning 2 years of training for a sportive! That’s the kind of event you’re dealing with here, a fact perfectly illustrated when I see the first riders out of the gate, a full team in matching kit, with the front rider slumped over his bars resting on his forearms in a time trial position taking the front for the rest of his “team”. There are a lot of local club riders too, riding together and working together to keep the speed high. Many local clubs have their own road side support too, with makeshift feed stations and water stops so they don’t get held up and lose time at the two official feed stops. It’s not that you have to ride it competitively, but it’s a bit like a marathon time for a runner. It’s such a popular sportive that people know someone who’s done it faster, or know what a good time might be for it. I’ll admit I did a bit of Strava stalking to see where I thought I would come time wise, because 3900m of climbing over 113miles, well that sounds like it would take me longer than it actually did, so it’s actually quite fast riding; but it’s still a big challenge. I’ll break the ride down for people wanting to know what it’s like for their first time. The start is a free for all with no allocated times, just set off between 6 and 8 am, so there are all level of abilities riding though at different times. Some of the roads are narrow so crowds can be a problem if you’re on a packed climb and people are walking. Where there is not a hill it’s reasonably flat, so if you’re in a good group it will flow beautifully between the major climbs. If you find yourself alone however it does drag a bit over some of the smaller rises. So for most of it you can just tick off the passes and get in a group to charge between them. 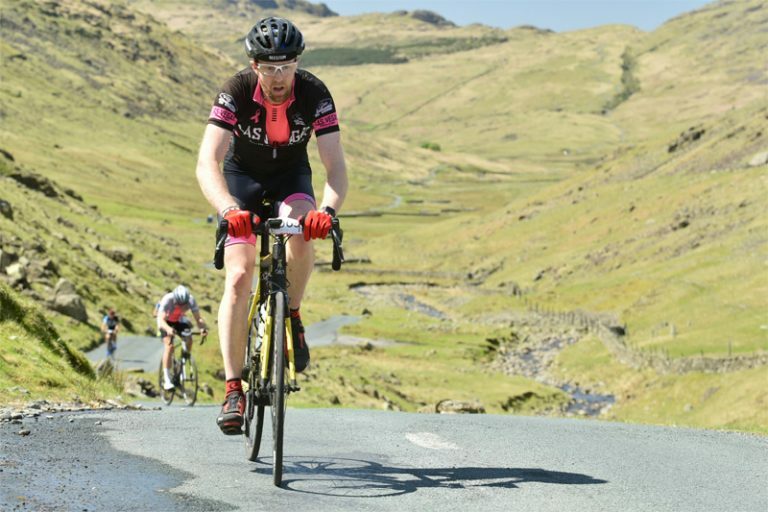 Honister is the first serious climb at just over 40 miles in, but every climb takes a little away from your legs as the burning sets in. The descents are mostly fast but people take them very cautiously and there are a lot of accidents on them. A marshal is usually present at anything dangerous so if you see one use your brakes, if you see arms waving pull them a bit harder. After the 3 final brutal climbs all in a row it’s a rolling but fast finish. A few minor lumps that just flow if you’re amongst some strong riders. Doesn’t sound that bad right? I’d cycled Hardknott and Wrynose once before, on a 39×25 gear whilst cycling coast to coast (St Bees to Robin Hoods Bay) in a single day (approx. 160 miles – 258km), and I had managed it with nice fresh legs and some sprinting and track standing to get my breath back. “I was probably fitter now too, so I should be fine” was my thinking on deciding that 39×28 would be perfectly suitable gearing for the Fred Whitton. I mean I managed it, I didn’t walk don’t get me wrong. I went out for a bike ride and I rode my bike the whole way, that’s a success on this sportive, not everybody (even some of those who set great times walked Hardknott). I even set a respectable time (the time starts with a 6 but is followed by a good quantity of minutes), but I just think that I can do a bit better, though perhaps that’s because I’ve forgotten how hard it was. With more sensible gearing that would inflict less pain and increase my confidence to push a bit harder. I did the Dragon Devil last year, 305km, that’s almost twice the distance and with more climbing. So in comparison the Fred Whitton should be easier, but as with most things that are shorter, it’s just more intense, a lot more intense. When I get to Hardknott at 90 miles in it kicks up to 25% as soon as it starts and it hurts. I’m crawling, barely moving as I slowly turn the pedals. Years of commuting have given me the ability to track stand for minutes, if not hours at a time, and I slow to a track stand to try and stop the burning in my muscles. It flattens off and it’s a drag towards to 30% hairpins. A few riders overtake me, we’re all hurting, some of us are cramping, one guy is walking, and walking faster than I’m riding. This is it, 30% the people are shouting as I enter the corner, I track stand again, taking a moment before I kick. The people start screaming at me not to stop “COME OOOOON!” I kick with whatever I have left, and I’m at the next hairpin, I pause for a second and the screaming starts again. The burning is way past fatigue and it’s not subsiding after that effort. One more wall to climb and the summit is here, only Wyrnose and the new 25% climb stand in my way now. Nearly there. Nearly there! Wrynose pass. A shell of a man. Crawling slowly forwards, eyes staring at the ground, mouth agape. 1, Be in a group for the A66. It’s about 23 miles in and will be a lonely place to be on your own. 2, Everyone said to save something for the 30% climb of Hardknott at the end. I would say to set a faster time don’t be afraid of setting your bike up with some small gears, and save less for the final climbs. 30% is no joke at over 90 miles in and not having an easy gear made me (and everyone around me) back off in the run up to it. I had a reasonable gear (39-28), but I climbed so slowly with it I would definitely have been faster keeping a good cadence on a smaller gear. Whereas my thinking before would have been “I’ll not let myself have a gear small enough to go slowly”. The climb of Hardknott should take aprox 15 mins (+ or – 5 mins if you’re a machine of you’re struggling), so time wise you’ll lose more going easy in the run up that you would on the climb even in a ridiculously low gear. (I have yet to fully test this theory, but it makes sense to me now). 3, Whatever you’ve done before this is a pretty intense and competitive event, and to set a fast time close to 6 hours takes some serious training and dedication, so be realistic and ride within your abilities. Pick a group wisely if you’re going for a fast one, everyone seems to have a target time, so have a chat and make some friends, don’t get too attached though as many groups are destroyed by the climbs. With finishing times varying between under 6 hours to over 12 hours a truly fast time requires a bit of luck and some smart choices, or some fast friends who work well together. No matter what though you’ll need some powerful legs. Like many popular events the Fred Whitton had a ballot system, meaning that you are not guaranteed a place unless your name gets pulled out of the hat. With around 2500 places available it might not seem like a large event, but on the narrow roads of the Lake District it is big enough. There are no short routes or medium routes, just THE route and some emergency bail out bits if you’re not up to it. The scenery is stunning if you have enough energy spare to pay attention, so a more leisurely time might be more rewarding in some ways. The support at the roadside was very impressive in the sunshine of 2018. Hill tops were lined with people cheering, holding banners and handing out gels and bananas to the riders. To the people who gave me gels: Thank you! You have no idea how much I needed them! I was thankful that the ride entry included a meal at the finish line, I hadn’t had pie n peas since I were a lad, and it reminded me I were back in’t North of England. Well done. What a beast. The valley with hardknott is just stunning, as is much of the other scenery here. Sounds like you had a warm one, a rarity! A cold wet start (hence the full finger gloves) and a hot sweaty finish. Difficult kit choice at 5am!